My next door neighbor makes an amazing mango salsa. And she's kind enough to hand me a bowl of it over our fence when she makes it. How lucky for me! Thank you Yen!! So, when I had some mangoes at home, I really wanted to try to make some salsa. And so I made it. It was really good - but hers is totally better. That's because I missed a key ingredient and also my mango pieces were a little on the bigger side. So, if you try this, do keep that in mind. Wash, peel and chop your mango into small pieces. In fact, make it smaller than what I show here. A good option would be to cut them into small pieces and then give a couple of pulses in a food processor. I missed that step and regretted later. Doing that would also bring out some of the juices from the mango. Chop 1 big tomato into small pieces and add to the mangoes. Now, add some finely chopped onions to the mangoes and tomatoes. Then, add some finely chopped cilantro. Now, add about 1/3rd cup of orange juice ...yes..this was my neighbors secret ingredient too. The other main ingredient I missed here was another 1/3 or a little less cup of lemon juice. So, if you are trying, do add that lemon juice for a way better flavor. Now, add some finely chopped jalapenos peppers in here - this give that kick needed and the taste buds rejoice between the spice from here and the sweetness from the mangoes. If you don't finish it off as is from the bowl, scoop some salsa with some chips and enjoy the crunch! I made this to serve along with my Homemade Veggie Patty Burger dinner. What are you going to serve this with? I got some really wonderful guesses - only one person had got it right though and that is Swetha who commented on the facebook page! Swetha - you know your desserts well or you know me well! Madhuri - I have to give you credit for that wonderful descriptive guess - you had me drooling and yes, please add in those walnuts - I think after I'm done publishing this, I'm going to go and make your creation! LOL! Yes - these are little Gulab Jamoons - taken out of the sugar syrup and rolled in chocolate and nuts! I was actually cleaning up my fridge - had both left over GJ's and some chocolate and nuts mix. So, decided that I'll introduce them to each other - just for sweet company! I had only 6 remaining - and dipped 3 in the chocolate - by the time I turned to pick the next one - they were gone too...thanks to the GJ loving family! I got to taste half of the chocolate rolled one and it was soooooooo good. The next time I'm planning to make just Chocolate Gulab Jamoons! Pick Up, Roll it, Tap It, Set it aside. This is surely sinful - but awesomely sinful! Try it the next time you make Gulab Jamoons and you will totally agree with me. 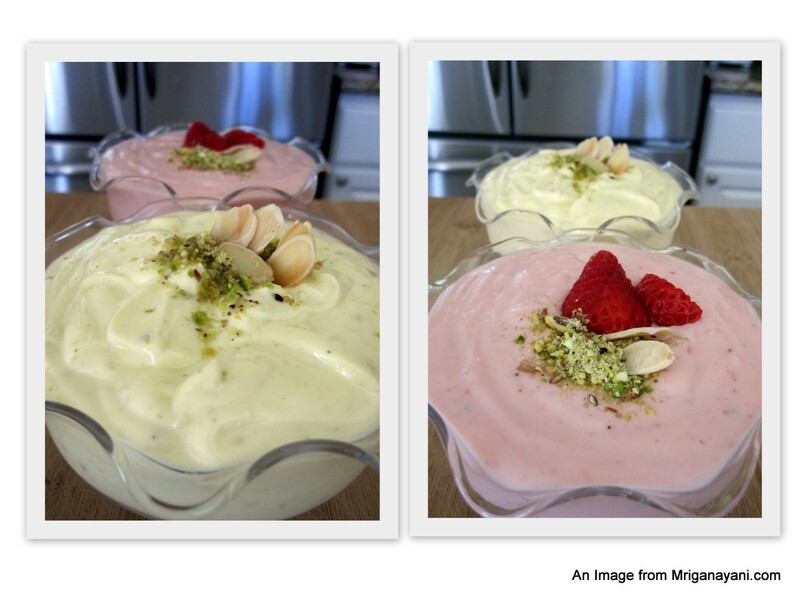 Make Yogurt at home - and then make Shrikand too at home! This is a special post for a dear friend and co-worker of mine - John and his wife Sharon. They had visited us once for dinner and I had served Mango Lassi and home made yogurt (dahi) as a part of the meal. They liked it and John has asked me the recipe for making yogurt at home along with step by step instructions. John, this is for the both of you. Do share with Sharon. 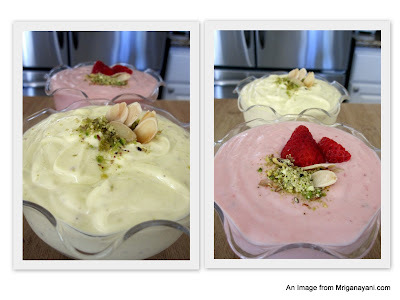 I remember Sharon talking about how she would like to add sugar to yogurt and she did try it and loved it - so I added another recipe below for what we call "Shrikand" - its essentially yogurt with sugar and different flavorings. Its one of my favorites! I've explained the process in pictures - hope it's easy for you to follow. Here's my 2.8 lit corningware bowl. Fill the bowl to the rim with milk. I normally use reduced fat 1% milk at home - the yogurt still comes out good. But, if you want thicker and creamier yogurt, go with whole milk. Move the bowl carefully to the microwave. For this amount, I heat up the milk for 18 minutes. If you are making smaller batches, heat up in intervals of 5 mins. You have to heat the milk until its almost boiling. You will start seeing little bubbles forming on the top layer - that means its done and you can stop the heating. Once the milk is heated, move it out very carefully - it will be very hot, you could wait a few mins before taking it out of the microwave. Take it out and place it on the counter for about 20 mins or until the milk cools down a little. You will see these thin layers of cream forming on top of the milk. Just mix it in along with the milk. When the milk is still warm (and not hot), take about 2-3 spoonfuls of yogurt and mix along with the warm milk. Now move the whole bowl to a cool oven (during winters, you could pre heat the oven and then switch it off). Place inside, close the oven and turn the oven lights on. The light provides consistent warmth for the bacteria in the yogurt to develop and spread - the probiotics - the good stuff! And that's how John you could make yogurt at home! Do try it and let me know if this works good for you. And now moving on to the part where I get sinful...and evil..and of course sweet! Let's make Shrikand! Here's what Wiki has to say about Shrikand - and I agree with them especially on this part - "Shrikhand's recipe is so versatile that it can practically take any taste that an imaginative person can create." I'm however going to stick to just 2 versions of Shrikand. The first one is a Kesar (Saffron ) version and the second one is a Strawberry Shrikand. I love the fresh strawberries I pick up at my farmers market - had to use them in this! You'll need a cheesecloth or muslin cloth for this next step. Place about 2 cups of yogurt in the center of a cheesecloth. Now hang this from the top of your faucet or any other place where this could be hung. Do keep a container a the bottom to collect the mess if you're not hanging this over the sink. Let this be hung for about 5 hrs. This is to remove all the excess water from the curds and make it thick and creamy. Move the thick curds to a mixing bowl. Now, add about 1/8th cup and a little more of powdered sugar to this. You can increase the sugar if you want it a little more sweet. This quantity is good for about 1 cup of thick yogurt. Next add 1/4 tsp of liquid saffron or if you are using the saffron strands, about a big pinch dissolved in a few drops of warm milk. Then, add a pinch of cardamom powder to this. And finally add some chopped pistachios and almonds to the shrikand. This can be eaten just like that. But, one of the traditional way to serve this is along with puris (Deep fried and puffed indian bread) - there is something about deep fried stuff and yogurt and sugar together - its an Indian thing! Now, moving on to another of my favorite versions - Strawberry Shrikand! Being peak strawberry season now, we get the most sweetest delicious strawberries and why not make the most out of it. You could also do a Mango Shrikand which is also very popular. But, I'm sure this can be done with most of the other berries and even fruits like apricots or peaches. Its what you can imagine and come up with - I'm sure they all taste great! Pick about 4-5 big strawberries. Remove the green stem - cut into 2 pieces and move to a blender. Give it a few quick whirrrrrrsss without adding any water. Blend until you get a nice thick juice consistency. In a mixing bowl, have another set of thick yogurt similar to what we made above - add sugar to taste. Then, pour in this thick fresh strawberry juice in there. Whisk well - don't you just love the colors here? Throw in some crushed nuts - pistachios and almonds work great. You could also add some chunks of cut strawberries if you like. Now, there's some tasty, delicious Strawberry Shrikand! And when you thought I was done with that - here's another quick look into how I like...no love my Shrikand..can you guess? Do you know me well? Add some chopped or powdered chocolate and nuts and mix well with the strawberry shrikand. Just take my word for it - you'll love it if you are a chocolate lover like me! Even otherwise, you might just end up loving it and become a chocolate lover like me! Ending on a sweet note with a parting shot - do try making these at your home and let me know how you enjoyed the process and the result! Here's a very desi twist on a very Californian fruit! Spanish origins actually but California prides itself in growing some of the best avocados in the world. I signed up to cook for Priya Mitharwal's event - Veggie/Fruits A Month event - and the STAR of this month is Avocado. When I accepted her event invite on FB, a friend and a follower of this blog Radha requested that I make something desi with Avocados. Here's her comment - "whoa! love avocados..cant wait to see new receipes..Anu, my request to you...please please.. invent a new receipe thats desi ishtyle.."
So Radha - I tried to give you just that. Desi Ishtyle Avocado Sev Puri, Avocado Dahi Puri and Avocado Bhel Puri! Hope you like it! But, I restrained myself from adding some sambar or rasam podi to this! I have to say that this tasted really good - actually I could not tell the difference between our regular chaat and an avocado chaat - tastes identical. So, do try this sometime. I'm sure you'll like it too! Here are my fresh avocados that I picked up in the morning from my local farmers market - love that place - wish it was a permanent fixture everyday. Its only once a week and I look forward now to going there each week - especially for the strawberries and cherries! And avocados too maybe from now on! Peel and chop the ripe flesh into small pieces. I chose avocados that are not very soft yet - these were still on the firmer side. Transfer to a mixing bowl. This is 1 chopped avocado. Now add some finely chopped onions -about 1 medium sized onion would do - make sure the quantity of onions is not more than the avocado - about the same or a little less would be good. You don't want the onions to overpower the subtle flavors of the avocados. Now, add some finely chopped tomatoes in to the mixing bowl. If you have some cilantro, chop it up finely and add here - I was all out and was cursing myself for forgetting to pick that up from the market! Let's flavor these little guys - I added some sea salt and red chilli powder. You be creative and add all you want to season this. You could add some chat masala or even garam masala if you'd like it spiced up. Mix everything well until combined. And now for the base - I used store bought papdi chips. You could either use the flat papdi chips like this below or you could make or buy the small sev puris or gols - click here for a detailed recipe on how to make the puris. You will need green mint coriander chutney and sweet tamarind chutney for the chaat. Here's a detailed recipe on Sweet Tamarind Chutney. For the mint chutney, just grind together 1 bunch of coriander leaves (washed well), 1/2 bunch of mint leaves, a couple of green chillies, salt, chaat masala - once ground to a smooth paste, add 1tsp of lemon juice on top. You're quick chutney is done! Now comes the fun assembly part. Pick up each chip and scoop in the avocado mix and place flat on the plate. Add a few drops of the green chutney on top of each filled papdi chip. Now add a couple of drops of the sweet chutney on top of the papdi chips. Top off with some fine sev. Done! How easy was that? You probably know by now that I don't stop at one picture! Sometimes I don't stop at two pictures. Moving on to Avocado Dahi Sev Papdi Puri - did I miss something in the name there?? Assemble the puris similar to the sev puri above and just add dahi on top. Since dahi can make stuff bland, add another layer of chutneys on top of the dahi too. Top off again with a little bit of sev and enjoy! Next, let's make it a trio today and make some Avocado bhel puri! I used a store bought bhel mix. Add the chopped Avocado mix on top. Add both the mint and the tamarind chutneys to taste. Mix well. Add some sev on top and you're done again! How's that little hill for a snack? Thank you Priya for hosting the event!